Many kinds of citrus are ripe, fresh, and fragrant just when the holidays are at hand. 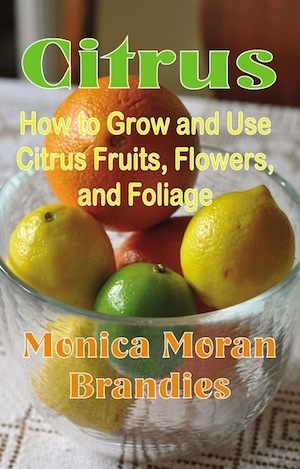 Monica Moran Brandies, author of the book, Citrus: How to Grow and Use Citrus Fruits, Flowers, and Foliage, likes it for its utility, beauty, and deliciousness. More information about which types grow where and when the fruit ripens can be found in her book along with growing instructions and recipes. 1. Oranges, tangerines, or citrus samplers are great gifts to give by the box. For local giving, buy the fruit yourself and put it in a nice basket or gift bag. Citrus is a very useful gift for every teacher, bus driver, and mail person. For long distance gifts, go to your favorite grove in person or online to order gift packages of citrus and citrus products. 2. You can give gifts made from citrus. Most families will love orange marmalade. My mother used to make grapefruit peel candy. Actually, I don’t recommend this for Christmas. It is good, but it can’t compete with chocolate. Make it a New Year’s gift when so many resolve to take off a few Christmas pounds. A strip or two of candied grapefruit peel often satisfies the sugar craving. 3. There is a long tradition of putting an orange in the toe of every stocking. For small stockings use a small variety such as the Clementine or a tangerine. For bigger ones use navel oranges. 4. If you have a giant size stocking, put in a pummelo. Many people have never heard of, seen, or tasted a pummelo. This granddaddy of the grapefruit is sweeter, less acid, less juicy, and much larger. You can eat the separated segments with a toothpick. No sugar is needed. More and more produce stands and groceries have these. We have a tree that never fails. 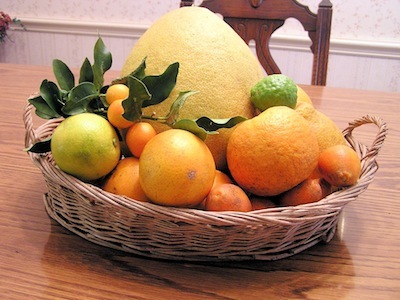 A big pummelo is a gift that won’t be duplicated or forgotten. 5. Citrus is good for wildlife. Give the birds, butterflies, and squirrels a Christmas gift by cutting fallen or second grade fruit in halves. You can put these on a windowsill or prepare a board or fence by hammering nails in with their tips exposed to hold the fruit. Put this in front of a window so you can enjoy watching the visitors. Even from a sick-bed one can enjoy watching the birds and butterflies come for food. If you have store-bought citrus, (I am writing this from Florida with 14 citrus trees in my yard) save the emptied halves of the peel and fill them with peanut butter, bird seed, or suet. 6. Use citrus for fragrance. If you have an open fire, indoors or out, put oranges among the refreshments and throw peels on the fire. Or save some peel just for this use. There is a high content of flammable oil in the skins and they make good fire starters or kindling. The fragrance of the orange oils mixes delightfully with the smell of burning wood. 7. Use citrus for decoration. Besides fragrance, their many shapes, sizes, colors, and textures make citrus fruits, flowers, and foliage ideal for use in decorative or floral arrangements. 8. Citrus enhances flavors. Many a baker would appreciate a small container of citrus zest, made by scraping the washed lemon or orange with a microplane grater. Lemon vinegar, easy to make and lovely in a bottle or jar, makes a great salad dressing or marinade, especially for fish. 9. Citrus pomanders make good air fresheners. Take an orange and stud it with whole cloves. If you float it in a punch bowl of hot apple cider or apple juice, the whole room smells wonderful and the punch is delicious. When you stud the fruit for pomanders to be dried, leave space for shrinkage. Leave an open strip and add the ribbon later. Display them in a bowl or basket with evergreen foliage as they dry. Later, hang them in the closet or put them in a drawer for fragrance. You can use calamondin oranges, lemons or limes, or large kumquats for this as well as oranges. 10. Add citrus to potpourri. Citrus peels and leaves add color and fragrance to potpourri and are also a fixative that makes all the fragrances last longer. Just skin off pieces of the outside rind with a carrot peeler even before you eat the fruit. About the author: Monica Moran Brandies lives near Tampa and grows herbs, fruits, vegetables, and ornamentals in her half acre yard. She was awarded the title of Alumni Fellow after giving a talk at the Pennsylvania School of Horticulture, now part of Temple University in 2008. Her articles and photos appear in the Brandon News Weekly and in most issues of Florida Gardening Magazine. Her books include Ortho’s Guide to Herbs (Ortho Books); Herbs and Spices for Florida Gardens; Florida Gardening: The Newcomer’s Survival Manual; A Cutting Garden for Florida; Xeriscaping for Florida Gardens; Shade Gardens for Florida; Landscaping with Tropical Plants; and The Florida Gardener’s Book of Lists.